The countdown to the Patriots kickoff is underway. And the anticipation is building even more for three sisters on Nantucket who have been traveling to every home game for more than 20 years! 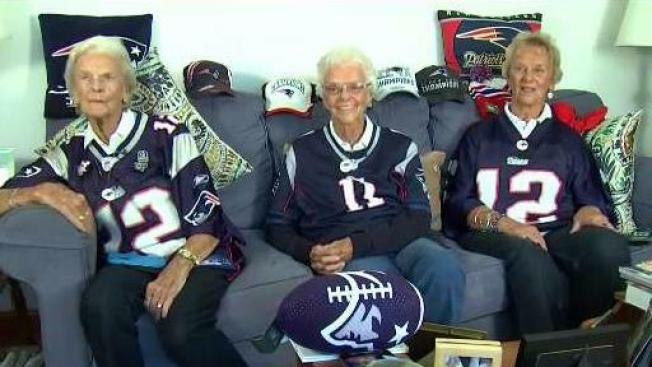 Eighty-seven-year-old Joan Fisher, 85-year-old Jeanne Dooley, and 78-year-old Jane Hardy, have been going to every Patriots home game for decades. And they’re set to be at the season opener again on Thursday. At this point, the three great-grandmothers have the routine down. "You have to get up at 5 in the morning. I come down and pick up Jane then we go pick up Joan," said Dooley. The trio then heads to the ferry dock in Nantucket to take the 2 hour boat ride to Hyannis. Then they drive to Gillette Stadium in Foxboro. "I was never allowed to drive with the husband on the main land and when the girls decided to go (to the Patriots games) I said, 'you know what, I'm gonna learn at your expense and I'm going to be driving,'" said Fisher. The trio has been fans since the beginning and in 2005, the Patriots deemed the sisters "Fans of the Year." They say they're undaunted by the often harsh New England winters and will go a day early if they know there’s a storm coming. The great-grandmothers say they'll continue to make the trek from Nantucket to Foxboro until the inevitable. "I hope for several more years," said Hardy with a giggle. "We hope as long as Tom Brady is playing, we’ll be there. It's a race between us and him."